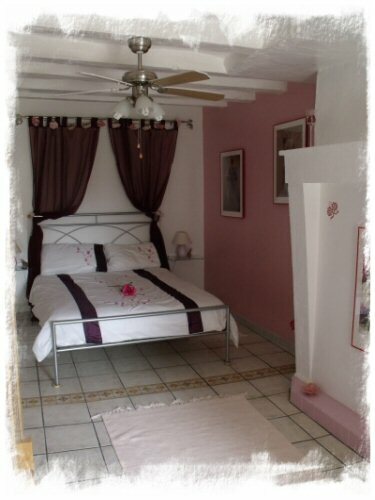 Les Deux Platanes is a very well appointed country cottage, immaculately maintained with high quality fixtures and fittings. We aim to exceed your expectations and provide a holiday cottage that provides a very memorable and relaxing holiday from day one. You should note that this is one cottage with two doors to the front terrace. All rooms are bright and inviting but retain the charm of the Brene cottage the salon and rose bedroom retain the original exposed beams. There is a wood-burning fire, and electric radiators are also fitted throughout the cottage should they be required. 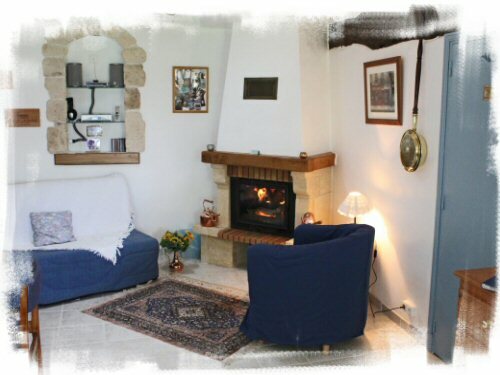 The great advantage of traditional French building is the ability to stay cool even on the hottest days making the cottage rooms a haven of comfort for those who need to escape from the sun. All windows are fitted with retractable fly screens to ensure you can enjoy the fresh air without those flying creatures entering the cottage especially at night when you may have the light on. The two external doors are fitted with opening top windows to view the stars at night or to check the external temperature before you pop down to the bakers for your morning bread. For gite hire of 7 days or more booked direct via this website**, a small 'arrival' pack is provided free of charge which contains, bread, butter, home-made jam, milk, tea and coffee, local Berrishon ham and a very good local goats cheese (the area is famous for the variety of goats cheese) plus a bottle of award winning local Touraine Method Traditionnelle demi-sec rose bubbly wine will be waiting in the cottage fridge to celebrate your arrival. The main external door leads from the terrace into the living room. 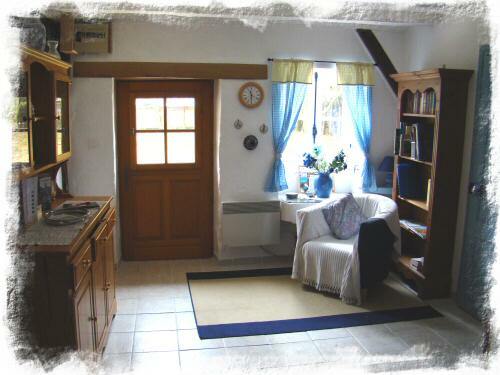 This room provides a comfortable base to sit and dine in a typical Brenne cottage environment. Internal doors lead to the kitchen and rose bedroom, the window looks onto the terrace. The main dining table can sit up to six. A pine dresser contains the crockery, wine glasses etc. 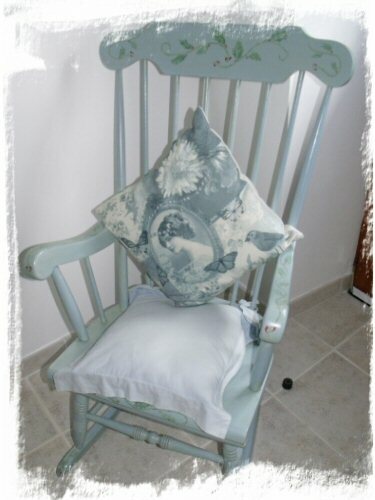 Comfortable chairs and drinks table to sit and read accompanied by a glass of your favourite tipple are placed next to the window. A home cinema system is fitted complete with LCD projector and large pull down screen. A good selection of films on DVD is available from the owners. 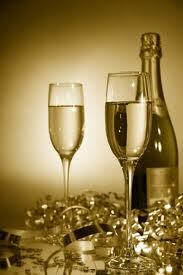 These can be reserved in advance and made available in the cottage on arrival. No television is provided but a CD player is also fitted for your use. A good selection of books is available in the bookcase. The two bedrooms are at the opposite ends of the cottage. 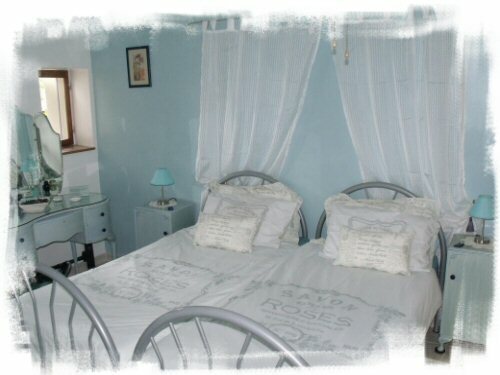 The blue bedroom, with 'on suite' facilities, is equipped with two single beds and has an external door leading directly onto the cottage terrace and an internal door leading into the kitchen. The rose bedroom is accessed via the living room and has a window overlooking the large enclosed garden. Both bedrooms are fitted with multi speed ceiling fans that provide a cooling ambiance during the night or day. A separate bathroom and toilet is accessed through the kitchen. 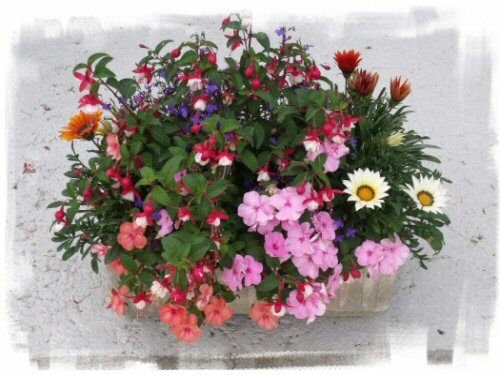 The décor in both is bright, cheerful and charming! All bed linen is provided. 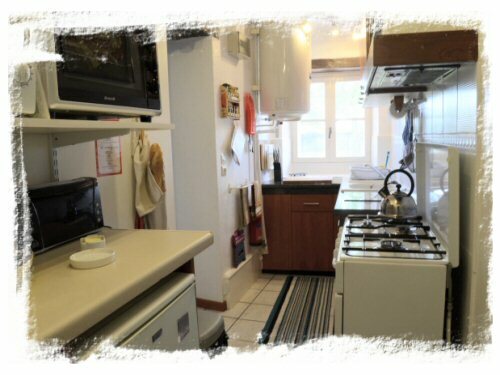 The galley kitchen is small but fully equipped and is more than suitable for preparing delightful meals. It is equipped with a four burner gas hob and gas oven. An extractor canopy plus ceiling extractor ensures your cooking fumes are quickly removed. To complete the equipment are a fridge and an additional small grill/electric oven plus a microwave oven. A full range of pans etc, kitchen tools are provided plus range of cooking essentials (herbs, cooking oil, etc) are provided. The kitchen window looks directly onto the terrace and garden. 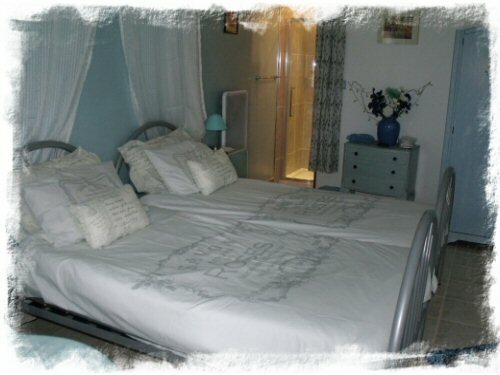 In addition to the en-suite bathroom / WC in the blue bedroom the main bathroom is accessed via the kitchen and has been recently fully refurbished. 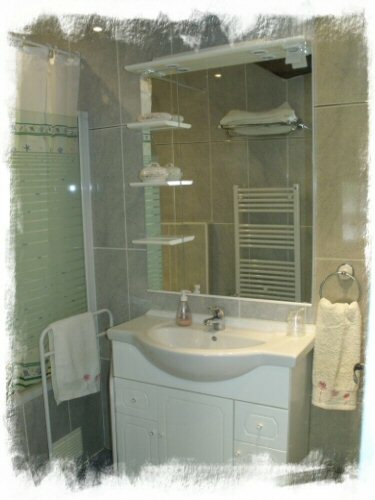 The small bath with overhead twin head shower has been fitted as families with younger children often prefer to use a shallow bath and a shower. Towels are provided. A separate toilet is also accessed via the kitchen. 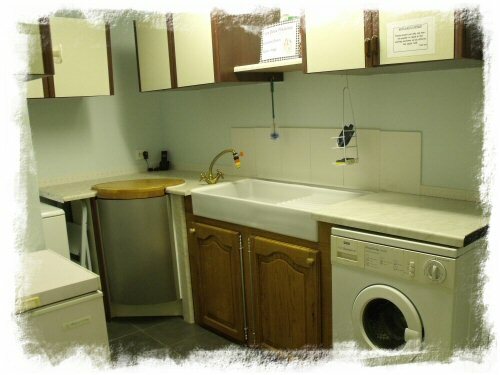 A fully equipped laundry room is situated in a separate building and is available for your use, this is equipped with 2 washing machines, and deep freezers plus the usual items for clothes laundering. A washing line for the cottage is situated in the garden. The cottage is accessed via the narrow tarmac road passing through the village. This road has very little traffic other than an occasional village car, farm vehicles or travelling baker. 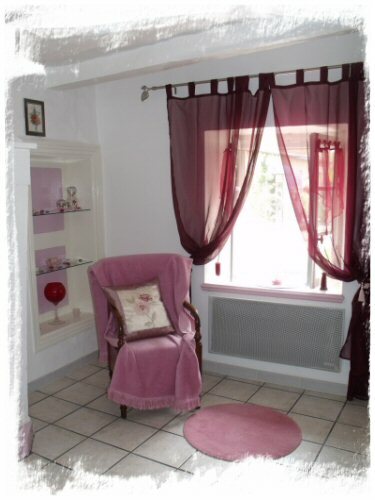 No shops are located in the village but are easily accessed in the local town of Clion or Chatillon sur Indre. Ample parking for cars is available next to the cottage. 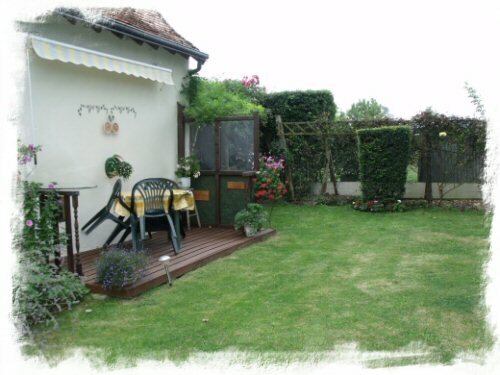 The large enclosed gated garden with dedicated parking, abundance of flowers and two magnificent plane trees / lawn is for the private use of the gite. Outside the main cottage doors you walk directly onto a paved terrace which is ideal in the morning to sit and enjoy breakfast or in the evening for aperitifs or dining 'al-fresco'. Two grand 'Plane' trees are in the garden and provide wonderful shade to sit under during the day or somewhere to relax with family or friends. Surrounded by an abundance of flowers you can also enjoy the recliners and small wood terrace which is positioned to catch the evening sun. 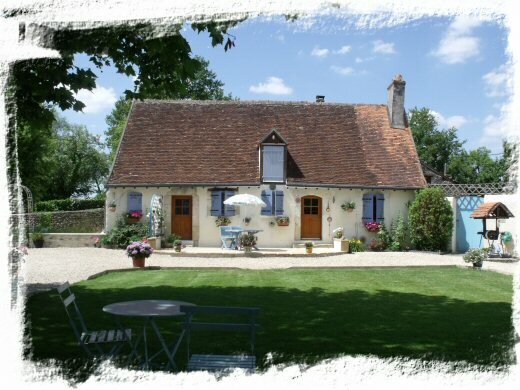 External dining table and chairs are also provided as part of your gite package. A barbecue and tools is available allowing 'al-fresco' cooking on a warm summers evening. In the field adjoining the bottom of front garden Madam Monique has a small holding with sheep, chickens and ducks and when they are not off wandering the field can be seen when it's feeding time or time for bed! The night sky in the garden of Les Deux Platanes can be spectacular. From various visits to University Observatories located on mountain tops over the years I am aware that that the complete lack of street lighting and other light pollution in central France makes for excellent star gazing in the clear night sky from the cottage garden. Past guests have often commented that the star filled sky at les Deux Platanes is like a good Planetarium! 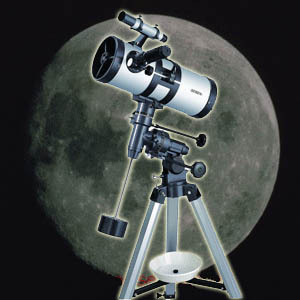 Guests now have an astronomical telescope available should they wish to sit and explore the wonders of the beautiful night sky, even better accompanied by a glass of the local gold medal sauvignon wines or maybe a late supper in the cottage garden! Free WiFi is available to guests. We have just upgraded our router to a Netgear N300 unit which should hopefully allow guests to connect to the web even when outside the gite, due to the increase in signal strength.